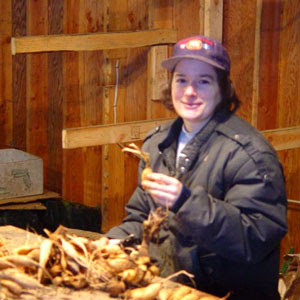 A Lynch Creek Farm staffer prepares tubers for storage. Whether you store your dahlia tubers intact after digging them, or whether you divide them first, you'll need to give some thought to the best conditions for storing what will be the basis of your next-year dahlia garden. It's essential that the tubers remain clean and healthy if they're going to give you beautiful flowers next summer. Dahlias differ in their ability to survive storage. Some varieties have thin tuber coverings that allow moisture to evaporate, causing them to shrivel and die. Other varieties can't tolerate dampness or temperature variations. It's a good idea, when you're choosing dahlia varieties to grow, to check with your supplier to find out if they have recommendations for over-wintering the dahlias you like. Dahlia guru Bill McClaren advises that dahlias grown from cuttings or seed are usually easy to store. Insulated containers, ice chests and cardboard boxes in the coolest part of your basement or crawl space are other options. In areas with light frost and slight rainfall, McClaren says, you can even place your tuber clumps or divided tubers in trenches in the ground, provided the drainage is good, and cover them with leaves and/or straw to protect them from frost. STORAGE CONDITIONS: The most important considerations, according to McClaren, are humidity and temperature. If these are right, your dahlia tubers should look the same when they emerge from storage as they did when you tucked them away in the fall. Storage temperatures should range between 40° and 50° Fahrenheit (4° to 10° Celsius). Humidity should be about 90 percent. If the tubers are too warm or too dry, they will shrivel. If the humidity is too high, they may mold or rot and disintegrate. Organic materials including peat, sawdust, or cedar or pine chips can be used, but be certain that both medium and tubers are dry. McClendon says these mediums have been charged with causing fungal infections in stored tubers. Some growers prefer sterile preparations like Perlite or Vermiculite. If you use these commercial products, take care not to inhale the fine dust they produce, which can be harmful to the lungs. INSPECTION'S A MUST: It's essential that you inspect your tubers regularly to make sure they are weathering their storage well. Check first within four to five weeks of storing, and then every two months for the remainder of the winter and early spring. If the tubers have begun to shrivel, mist them with a fine spray of clean water. Then occasionally mist the area lightly to increase the humidity. If, on the other hand, the tubers are limp or show signs of mold or rot, remove those with any signs of these conditions and decrease the temperature and humidity of the area. It may be necessary to use a pot of dessicant to reduce the humidity. If the area is too warm you may need to remove the tubers to a cooler area. Get it right, and you'll have a full complement of tubers to plant in the spring. And be of good cheer: if you lose a few tubers, you'll have the fun of choosing dahlia varieties to replace them. 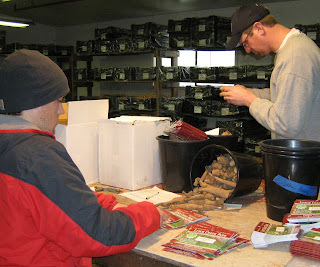 There sure are a lot of options for storing Dahlia tubers! I am preparing for my first divide and store and really hope to choose the best method. A friend of mine suggested 'sand' as a medium for storage in order to deter mice from getting to them. Has anyone heard of this before? Perhaps perlite or vermiculite would do the same thing? Also, one site recommends dipping the ends of each tuber in sulphur. Has anyone had experience with this? Thanks for any thoughts! Always a back breaking but worthwhile job, thankfully I am hoping our warm Autumn means I can put it off for awhile!